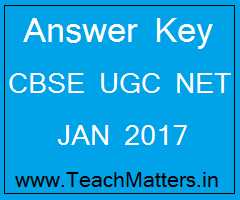 CBSE UGC NET Answer Key JAN 2017 Exam 22.01.2017 - Solved Q. Papers. (Last Updated : 02.05.17). Answer Key of UGC NET JAN 2017 Exam 22.01.2017 - Download UGC NET JAN 2017 Answer Key for paper-1, paper-2 & paper-3. CBSE NET Answer Key of NET January 2017 exam held on 22.01.2017 can be downloaded here after the exam. CBSE conducted UGC NET JAN 2017 Exam on 22nd January 2017 at various examination centres. Get unofficial & official answer key of UGC NET 2017 January exam here. Official and final Answer key of UGC NET 2017 exam are available here as and when CBSE uploads these answer key on the official website of CBSE NET. Download answer key of UGC NET Exam January 2017. Candidates appeared in CBSE UGC NET Exam 22.01.2017 can see/download unofficial Answer Key of CBSE NET January 2017 Exam. Official answer key has been published by CBSE on 02.05.2017 on the official website i.e. www.cbsenet.nic.in. So, you can get official Answer Key at www.teachmatters.in after the exam. Answer Key and Question Papers of UGC NET January 2017 exam have been uploaded here. Answer Key of UGC NET JAN 2017 published here are official. Candidates are advised to wait for Final Answer Keys of NET JAN 2017 Exam to be published by CBSE as per the schedule. Visit this page regularly for Updated, Official & Final Answer Keys of NET 2017 Exam. Candidates can download OMR Sheet Images and challenge answer keys, if they want to do so from 02.05.2017 to 08.05.2017.